I had three great guys at Don Pedro on Monday the 16th of February. The day was suppose to be around 70 degrees and I know it was at least that. The day could not have been any nicer. We hit our first spot on the lake and as soon as I got our two rods fishing, we didn’t go 75 feet and wham! fish on and soon it was off, I reset the rod and another 50 feet again wham fish on! and almost to the boat it was gone. well that was it for a short while and finally we landed one, the action just wasn’t good enough to stay in the area, so we moved on and a half mile away we had another strike. I decided to make a major move, so we picked up and moved about three miles, I changed some tactics and it wasn’t long before we finally started catching some fish. They ended the day with 11 rainbows in the cooler and they lost 6 fish. A great day on the waters of Don Pedro. 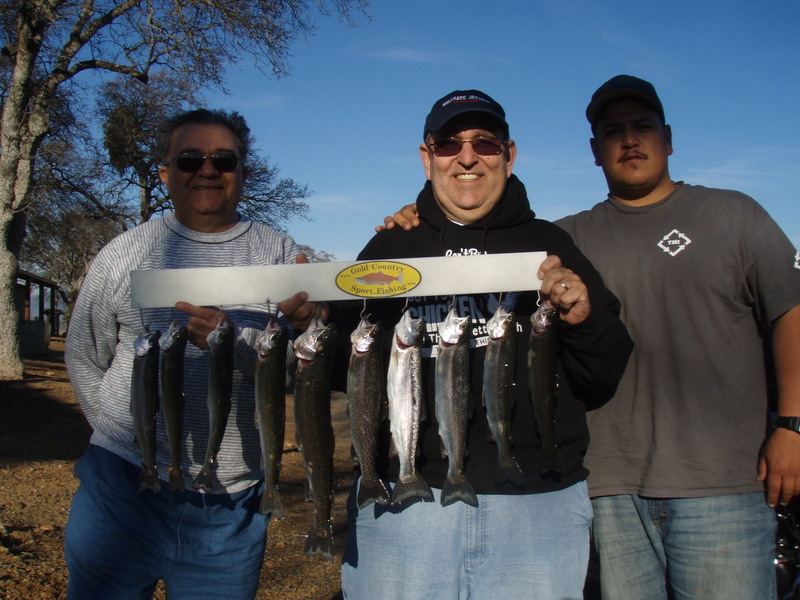 This entry was posted in California, Don Pedro fishing guides, Don Pedro Lake, Gold Country, Gold Country Sport Fishing, Winter Fishing. Bookmark the permalink.